Bank Street Toyota’s collision centre will have your Toyota looking as good as the first day you bought it - and in no time! From complex bodywork to a complete interior and exterior wash, Bank Street Toyota has you covered. Our team of experienced and dedicated technicians has years of experience working on Toyota vehicles, and they know how to get them looking their best. Bank Street Toyota offers a wide range of detailing packages ranging from a complete wash and wax with engine bay cleaning, to simple interior or exterior washes. 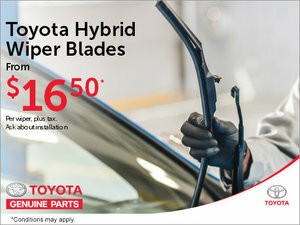 If your vehicle’s exterior is in need of a little attention, bring it into Bank Street Toyota and we will get rid of those pesky scratches and paint chips in no time. We use only the very best equipment as well as the most modern technologies in order to ensure that our work always exceeds your expectations. Our skilled team is ready to make your vehicle shine! Book an appointment with Bank Street Toyota’s collision centre online or contact us at 1 855 217-7044 today.